To make your family travels go as smoothly as possible Diono have created a range of products to help parents out. The three items below allow you to see your little ones with ease when in rear facing seats, store their belongings tidily in the car and keep a it shaded in the back seats - essentials whether venturing abroad, enjoying day trips, or just preparing for the school runs! The Diono Easy View Plus™ allows parents to keep an eye on their little ones when they are in a rear facing car seat helping make the school run fun. The Easy View Plus is easy to attach with or without headrests, doesn’t block rear visibility and does not need to be positioned directly over a child. The perfect angle for vision is created by a pivot ball mechanic for 360 degree rotation - without even having to move your rear-view mirror. The Easy View Plus provides a large crystal clear viewing mirror, which even has a light, and remote control so you can check your baby in the dark, perfect for when the autumn evenings start to draw in. RRP: £20.00. The Diono Stow n Go will revolutionise your school run. 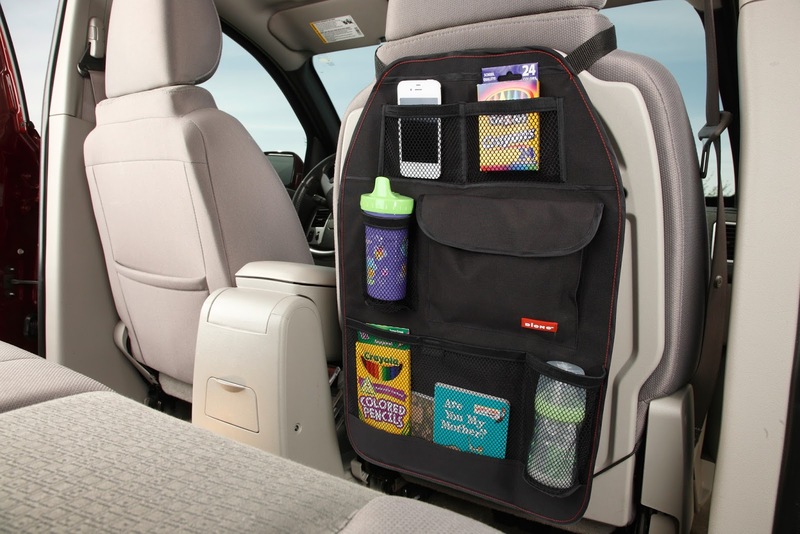 Have all your car-journey essentials in one place, the organizer simply hooks over the seat in front and has seven pockets and two drink holders in a washable and waterproof fabric for your little ones to store their treasures, snacks and drinks to occupy them when they are on their way to and from school. The top fastens around any head rest while the bottom fastens around the seat for a secure fit. It folds away for easy storage in seatback pocket when not in use, and is crash tested. RRP £13.00. 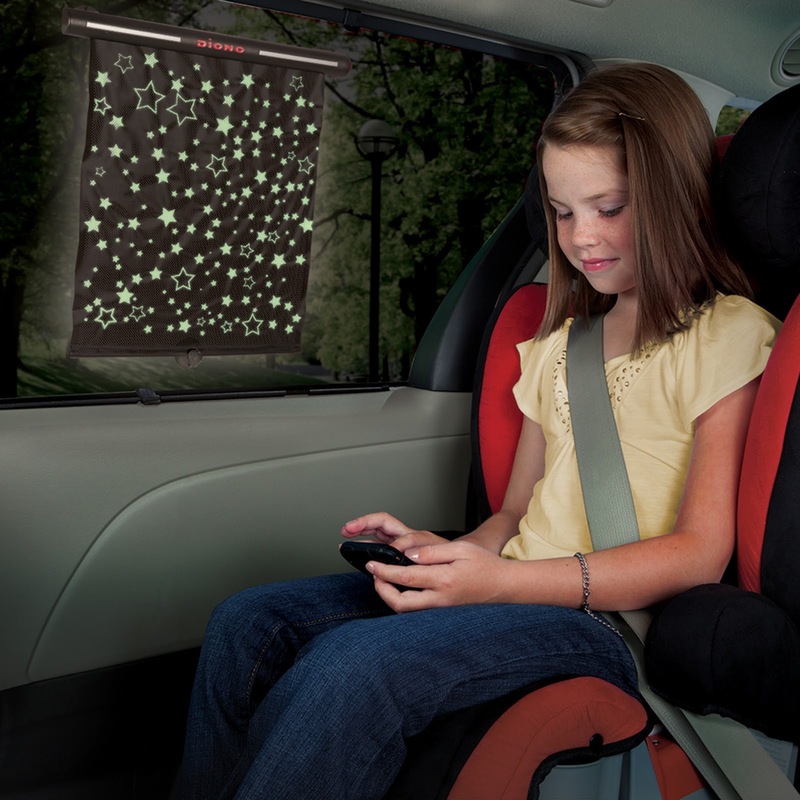 The new Diono Starry Night Sun Shade is the only blind to block the sun by day and provide Day-Glo stars by night creating the perfect environment for a pre or post-school car snooze. The unique PVC fabric provides year-round protection from the sun whilst the starry night design provides a magical sleep setting. The shade attaches securely to the window with simple suction cups and rewinds with the touch of a button. RRP £12. For your chance to WIN an Easy View Plus, Stow n Go or Starry Night Sun Shade you can enter via the Gleam entry form below. The giveaway ends at 11.59pm GMT on 23rd August 2016. You can never bring too many distractions along! Prepare to sing your lungs out, more singing the better, kids love it! Plenty of nibbles and plenty of games we can all play together like spot the yellow car or eye spy! Always have family favourite cd's at the ready we take it in turn to sing a verse. We also have a game where we look out for pub or hotel signs that have legs in title aka the lion that's 4 points loads of rows on this one but good fun. Plan well in advance, then you will not forget anything. We regularly travel long distances with our four year old. I keep a bag of things to entertain him in the boot. Make fun pack lunches and a little goody bag with activities like colouring book and pencils and little mini travel size games! Bring a charged ipad and an external charger too! Bring wipes and a change of clothes - I always forget these and often regret it! Have some planned family activities as well as things like Internet/DVD's etc. Good selection of snacks, drinks, wipes etc will serve you well too. pack light you will be carrying your bag a lot!! Bring snacks and things to do. And use your scenery to encourage interest. take plenty of snacks and drinks, even if its a short journey, you never know if you will be delayed. Make sure you keep a little sos box in the boot! have lots of snacks and things to play in the car (we are masters of i spy) and make sure you cater for lots of bathroom breaks! My advice would be to have books to listen to via audible to make long journeys pass more quickly! Pack lots of activities and lots and lots of snacks! Make sure you have lots of activities, lots of snacks and make sure you don't give them everything all at once, spread it all out through the journey. Dont travel with three under 4 year olds alone! My travel tips are (a) always take more of everything you need than you think you'll need to allow for delays etc. ; (b) story or music CDs are better than screens to work on and watch and help to avoid travel sickness; (c) always have some verbal games you can play up your sleeve - great as a distraction and help to pass the time. Leave plenty of time for rest/toilet breaks. Take a bag filled with essentials, drinks, snacks, wet wipes, plastic bags etc and keep within reach. Take gadgets with games on to keep the kids quiet and give them something to do. We always have a set of travel things in the back for my niece, like a drink, toy/game, tissues. But we don't give her books as she gets very car sick. She also has a handheld fan now which helps the sickness a bit if she's hot. make sure you have a stash of toys to occupy them! Plenty of snacks is a must!! The trusty nintendo 3ds and loads of word games/memory games. Pre load up on lots of peppa pig! Be prepared, always have a carrier bag for rubbish, a stash of wet wipes and refreshments. Charged up laptops to play DVDs always work! let the kids pack their own mini boredom bag for the journey! Plenty of snacks an Ipad loaded with films and lots of games to play! If u have kids blank paper and pencils are great, my 4 kids love hangman, noughts and crosses and drawing comps etc. Always have baby wipes too.